In recent years we've seen utility come to the fore in many of the new kit designs. However, with a few exceptions, all of the offerings have defined utility as being two-people carrying only what they need to get by. This utility has also been available only in kits, so the price of entry is daunting to some. And then there is Bob Barrow's scratch-built, plans offering, the Bearhawk. 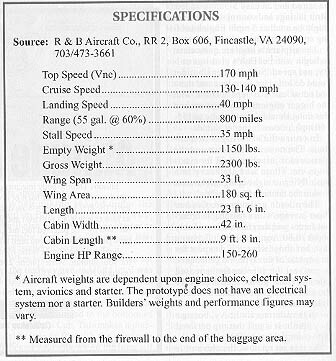 Bob defines Utility as an airplane with few limitations in the way it is used. This includes four full-sized seats (the cabin is the same size as a C-172), 1200 pounds useful load, 55 gallons of fuel standard, and the ability to hang anything from 150 to 260 hp in front of the firewall. Now that's a usable airplane. Barrow's airplane is also unique in today's homebuilt environment, where the predominant thought pattern seems to be build-it-fast-and-don't-worry-about-the-cost, because a) it is only available as plans and b) it emphasizes simplicity and low cost. The cost of entry required to build Bob's 130-150 mph, carry-anything-and-land-anywhere airplane is the two hundred bucks for the plans. Past that, you can spend as much as you like, when you like, as fast as you like. That's the beauty of scratch built airplanes. You can spend a couple hundred bucks on aluminum and start hammering out ribs, or drop a much larger bundle for the entire bill of materials, which in the Bearhawks' case is estimated at under $6,000, which includes everything (as in everything!) with only the engine and prop to be add. Bob did not start out to design an airplane to sell. In fact, the Bearhawk was originally a project meant to fill his own needs for utility in his airframe and engine building business. But, we're getting ahead of ourselves. First, it is necessary to understand Bob Barrows and how he came to be sitting under his airplane at Oshkosh answering a million questions about his obviously useful airplane. Bob has been a practicing mechanical engineer for nearly thirty years which included a long stint as Manager of Engineering for one of Ingersoll-Rand's facilities in Virginia. However, that was only one part of his dual life. Outside the office, he had developed his own little airport, where he built airplanes and re-built engines. Initially, he built a Midget Mustang, then designed and built his own STOL, single place bird he called the "Grasshopper." He flew that for 15 years before parting with it. Then there was a 260 hp, symmetrical-everything, Pitts type aerobatic machine. And an RV-3. And a couple of rebuilt projects. By 1980 his engine business was picking up and he began to feel the need for a utility type airplane and he began work on what he then called the RB-4, which was renamed Bearhawk. 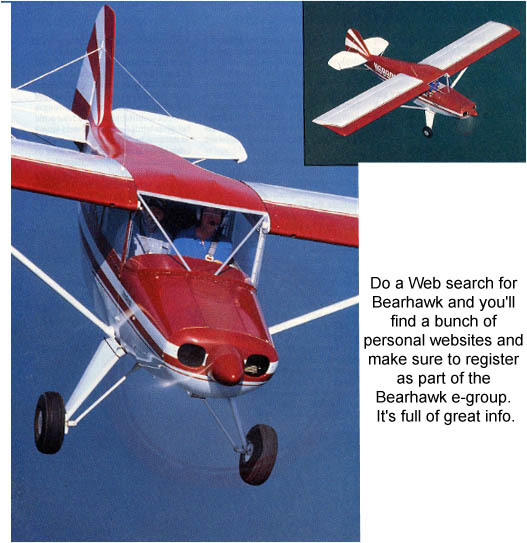 "I got some parts finished, spars and ribs and such, but then I decided I needed a four-place airplane for the business right then and bought a rag-wing, Cessna 170 project." The Bearhawk languished in the backwaters of his project ladened shop until he decided to leave Ingersoll and strike out freelance in 1988. "My engine business was doing well, so I wasn't afraid of being out there on my own." Confident words from a man with a wife and four kids. It was at that point he decided to finish the Bearhawk which took "...oh, I don't know, a year or two..." He acts as if building an airplane is a monthly occurrence on his little strip. Which brings us up to Oshkosh '95, by which time he had been using the airplane for several years in his business. Bob makes no bones about the fact that his airplane is a working airplane. Not a show winner or a machine designed to blaze cross country in formation with the composite crowd. However, whenever we walked past the airplane on the flight line, there was always a number of folks asking questions or hanging their heads down in the cockpit to see how this or that was done. The airplane was of interest to a lot of people because it was an airplane that makes a lot of sense. Which is exactly the reason I was attracted to it. It makes so much sense in so many different ways. Bob is one of the friendly, more soft spoken types you'll find and was quick to agree to a flight. He is also just looking for an excuse to go flying. While we were waiting to pull out from the flight line, I spent some time looking the airplane over. The wings are all aluminum and many of the details, Barrows is quick to point out, lean heavily on Midget Mustang/RV technology. This is especially evident in the spars, which are "C" shaped .032" channels with 1/8" x 1 1/4" straps of varying lengths riveted to the web face inside the flanges. The straps are stacked in varying depths and lengths depending on the stresses and are centered on the outer strut attach point rather than all eminating from the root as with cantilever designs. The flaps and ailerons are all aluminum framing with fabric cover and hang from the rear spar, which Barrows says is heavier than normal for that reason. The ailerons hang on long, tubing weldments which form tripods bolted to the rear spar. The flaps, which extend all the way out to 50°, are simple hinged affairs. Bob says he considered Fowlers but opted for hinged flaps because of their simplicity and small trim change when deployed. The ribs are all hand formed over wood forming blocks with no stretching done. Instead, they are partially bent over the forms, then the flanges hammered to 90° while off the form. The resulting distortion in the rib is removed by fluting the flange between the rivets. The entire control system, elevator and flaps included, uses cables and pulleys rather than push rods, although bellcranks do move short pushrods to activate the ailerons. The bellcranks and final pulleys mount on steel tubing weldments bolted between the spars. The 33 foot wings are skinned in .025" aluminum and use bucked or squeezed solid rivets throughout. The struts are aluminum and Bob says the best source for them is damaged 180/182 Cessnas. His are four inches shorter so struts with broken forks can be salvaged and used. The fuselage is good, old-fashioned steel tube, which Bob used for a reason. "From an engineering standpoint, steel tube is easy to analyze and the calculations are reliable," Bob explains. "It also offers excellent protection in case of an accident and is easy for the homebuilder to build with a minimum of tools and jigs." In reviewing the plans, I found nothing in the fuselage that was even remotely difficult or unusual. In fact, the main wing fittings nest a "U" shaped fitting inside the usual blade-type fitting which not only gives additional area for bearing strength without welding across the load path, but gives a huge amount of weld length so the quality of the weld becomes less critical. There is a lot of this kind of thought through out the airplane. Because the fuselage changes cross sectional shape quite often, it looks as if it is going to be one of those fuselages in which the top and bottom trusses are built first, then jigged into position and the side pieces added. The most complex pieces, actually the only complex pieces, are the Maul-type oil-spring shocks in the landing gear. Those will require a little machine work but the result is an aerodynamically clean shock system which doesn't take up any cockpit space. When the cowling is opened the first thing you'll notice is the huge amount of space behind the engine. There's at least a foot of empty space! But, when there's a 260 Lyc under the hood, that's where the extra set of cylinders go. The propeller stays in the same position, so the cowing remains unchanged regardless of which engine is used. The only changes necessary are putting the battery behind the huge baggage compartment rather than on the firewall. The nose bowl, incidentally, is a Pitts Special unit. When poking around under the hood on Bob's personal Bearhawk, you'll also notice there is no starter or alternator. One of his friends says Barrows is allergic to electricity. When we finally found ourselves out on the taxiway and saddling up and I was delighted at his door arrangement. First of all, there is a door on both sides and the bottom half hinges forward, while the top half is hinged to the bottom of the wing like a Cub. This makes it practical to taxi or fly with the windows open and your elbows on the door sill like you were cruising the drive-in on a Saturday night. The cabin is also extremely tall and full of light, rather than being dark and crowded feeling. The seating position is very Cessna in its approach, a fact which allows the builder to use a modified Cessna 172 windshield on the Bearhawk. Both the front and back seat room is the same as the Cessna 172. Bob has no seats in his drawings, but adapts existing seats and tracks to his airframe. His machine uses Tri-pacer seats. If I had a complaint with the airplane it was having to fly on the left side with a right hand throttle. Yeah, I know, you should be able to fly either way, but having a control stick in the left hand and a throttle in the right just doesn't seem right. In taxiing, a slight stretch lets you see completely over the nose, which isn't really necessary but makes it nice, nonetheless. A little brake was necessary for taxi because the tailwheel springs were extremely loose. I glanced up at the trim, which is a Cessna-type wheel mounted in the ceiling, satisfied myself it was where Bob recommended, and started the throttle in. The engine in Bob's airplane is an 0-360 set up for mo-gas which he figures gives about 170 hp. As the throttle went in and the constant speed prop began biting in, the airplane literally lunged forward. I'm a real fan of machines that start pumping adrenaline right from the starting line and this is one of them. What a delightful monster this thing would be with 260 hp! Bob recommended that I don't force the tail up but let it come up on its own, which worked nicely and almost as soon as it was up, the airplane left the ground. Actually, it didn't just "leave" the ground. That's too simplistic. It acted as if the landing gear and the ground were like-poles on magnets and the airplane was repelled away, it separated so cleanly. The takeoff happens so quickly, there's little or no time to analyze what it is doing directionally. But whatever it was doing took only a tap here and there to keep the centerline where it should be. Considering that we were in a four-place airplane, the initial rate of climb was almost startling. It immediately started up at around 1,300 fpm. With a 180 hp engine the powerloading at gross would be about 12.8 lb/hp which is quite respectable but with a 260 hp, it would be 8.8 lb/hp which puts it in the skyrocket category. With two people and half fuel, it would be around 6.5 lb/hp which is right up there with the serious aerobatic specials. What a kick that would be! We arrived at 4,000 feet in nothing flat and I put the nose down setting up a 23 square cruise which eventually settled out at about 120 knots, or 135-138 mph. Which brings us to one of the points I liked best about the airplane: It is ready made for doing all sorts of little homebrewed mods, beginning with milking more speed out of it. The wheels and brake assemblies could be faired and an easy 3-5 mph added. Strut fairings and control surface seals might be another 3 mph. Engine cooling another few knots. The airplane's lines are quite clean to begin but Bob's goal was utility, not speed. Still, the homebuilder could do little clean-ups here and there and net at least 8-10 mph at cruise. With the bigger engines there is no reason this thing shouldn't be cruising at 155-160 mph, or even higher, at altitude. In cruise the visibility is tremendous. The nose is well down and the glass area is just about right for maximum vis. Those who are heavy into bush flying or sight seeing might want to skin the doors in Plexi. The aileron pressures are Cessna/Piper-average with a reasonable break-out forces and the roll rate is probably about 70-80°/sec, which isn't lightning fast, but about what you'd expect for an airplane of this type. I'd be tempted to gap seal the ailerons for increased rate and either go for spades or move the aileron hinge point back a little to lighten them up. Don't construe this to mean the ailerons are heavy, because they aren't. It is just that my personal taste is for lighter, quicker ailerons. As it is set up now, the elevator is matched to the ailerons but the rudder is relatively light and tremendously powerful with only a hint of break-out force, so coordinating at first takes a little practice to keep the ball in the middle. Even before we got in the airplane Bob said he was still experimenting with various details, one of which was the stabilizer setting. In doing stability tests we found the airplane would begin to return to neutral if pulled off trim speed (statically positive) but then it would begin to gain speed and wouldn't level out as the speed built up (dynamically neutral). We discussed this in some detail and after Oshkosh, Bob called to say he had changed the stab setting by 2° and it had a marked effect on the same tests. Now it was dynamically positive and if pulled 10 knots off trim would gain less than 10 knots on the initial down line and would damp out entirely with no phugoid remaining in three cycles. We wandered over to an outlying grass field and set up to shoot some landings. As I made the first power reduction opposite the end, the airplane's basic clean lines were obvious in the way it held on to its speed. It took more work than you'd expect for an airplane of this type to get down to the flap speed of 80 knots. The first landing was made with half flaps at an approach of 60 knots which Bob says he recommends for the first few landings, although he's perfectly happy using 45 knots. The first landing was a non-event because the airplane settled on in an effortless three point and rolled straight ahead for a short distance before stopping on its own. Then I started playing with full flaps and lower approach speeds and found it took a little more technique. With 50° of flap, the airplane is really nose down, so with only two of us in the airplane it was fun trying to get the tail down at just the right moment. Power-off with the CG that far forward, there wasn't quite enough elevator and I'd touch main gear first with the expected hippity-hop. The preferred approach would be slower, with just a little power to keep the elevator working. When we were all done flying and I was sitting around with a Delta Charley (diet cola) thinking about it, I found there was alot about the Bearhawk which I found wildly attractive. In fact, given the opportunity, I could actually see myself building it. In the first place, it's no secret I love bush-type aircraft. So that's part of the airplane's attraction. I also love the basic simplicity of the airplane and Barrows straight ahead approach to design. He doesn't complicate anything and, because of that, it is easy to see how things work and how to fabricate them. I was thumbing through a couple of back issues of his quarterly newsletter, Bear-Tracks, and found yet another reason I like the airplane: His straight-up design approach is followed by a similar philosophy in supporting his builders. He doesn't waste a lot of time and effort in designing brochures or fancy graphics, he just gives the builder totally understandable directions on how to build things with a minimum of tools. What he doesn't do in gloss and color, he more than makes up for in clarity and understanding. The newsletter presents a lot of neat building tips. The drawings themselves are professional looking blue-lines and show his background as both an engineer and long-time airplane builder. And then there is one of the other points about the Bearhawk which is attractive: It is so simple and well done that it makes a flawless platform for someone who wants to incorporate their own ideas in cosmetics, streamlining, interior, etc. For those who are afraid of doing their own welding (shame on you): Bob reports several manufacturing shops have contacted him about building component parts for his builders. So there is help out there for the faint of heart. We haven't had many four place airplanes offered to the homebuilder in the past and none have caught on. The Bearhawk looks as if it should change that trend. Afterall, think about its name: It's a Cessna Skyhawk in concept with the brawn and attitude of a Bear. Bearhawk. What a combination! HOT BEARHAWK NEWS...KITS NOW AVAILABLE! !